WorldCat World-wide catalog that includes over 40,000 maps with the Subject "California" and the Format "map" as shown in the graphic below. To this basic search you can add other keywords that describe your subject of interest. 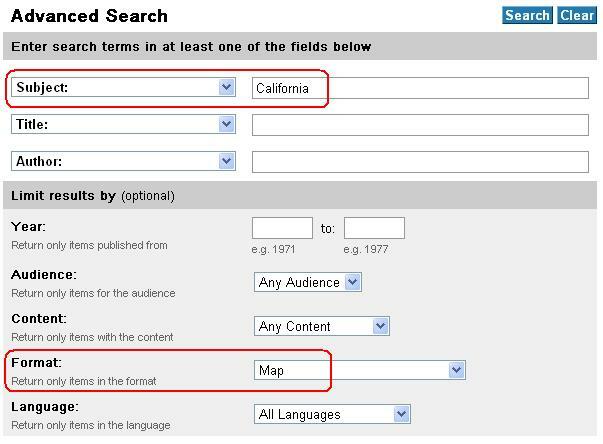 To limit to just online resources 1) choose "Website" in the "Format" drop down box, 2) enter "map" as a keyword, 3) enter "California" as a subject and 4) enter any other keyword (s) that represents your specific subject of interest. ArcGIS Online (ESRI) Includes over 700 California map data layers that can be viewed using the ArcGIS map viewer or ArcGIS Explorer. Atlas of California (Donley) 1979 (atlas G 1525 A84) The major thematic atlas for California containing maps on a wide variety of physical, demographic, cultural, and economic topics. Atlas of California (Maps.com) 2001 (Atlas G 1525 M3 2001) Small format atlas containing approximately 50 historical and thematic maps of California . Each map is available online using the web address and key code listed on each map in the atlas. California: a Changing State: an Atlas for California Students (Humboldt State University and California Geographic Alliance) 2011(print copy available in Atlas G 1525 C34 2011) Collection of physical, cultural and historical maps of California. California Atlas: A Geographic Journey (California Geographic Associates) 2000 (atlas G 1525 C35 2000) Small format atlas containing maps on approximately 20 historical and contemporary topics. California Digital Maps (UC Berkeley Earth Sciences and Map Library) Includes over 500 digital maps of California. California Maps (Maps.com) Collection of historical, political, physical, demographic, outline and cultural maps of California. California Patterns: A Geographical and Historical Atlas (Hornbeck) 1983 (atlas G 1525 H6 1983) Emphasis is on historical maps. California State Map Collection (Geology.com) Included in the collection are a physical map, elevation map, county map, road map, and a water resources map. Digital Atlas of California (California Geographical Survey) Series of statewide and major metropolitan area thematic maps that show population and race, citizenship, income, poverty and adult educational attainment. Maps (California Department of Forestry and Fire Protection) Collection of thematic maps on California physical geography, land use and development, biogeography and fire hazards. California GIS Map and Information Sites (Coordinated Legal Technologies) is a directory of county map and GIS sites. ABAG Geographic Information Systems (Association of Bay Area Governments) Interactive mapper covers the San Francisco Bay area. Atlas of Social and Economic Conditions and Change in Southern California (Raettig, Elmer and Christensen) 2001 (USFS General Technical Report PNW-GTR-516) (print copy available in Docs A 13.88: PNW-516) Choropleth maps and text document the current status and changes that occurred during the 1987-1998 period in the social and economic conditions of 26 southern California counties. NavigateLA (City of Los Angeles Department of Public Works, Bureau of Engineering) Web based interactive mapper that provides over 400 layers of geographic information, linked databases, and reports. Northern California Atlas and Gazetteer (DeLorme) 1998 (atlas G 1525 D42 1998) Series of 1:150,000 scale maps that show topography, roads, cultural features, recreation and historical sites and trails. SANBAG GeoViewer (San Bernardino Associated Governments) Emphasis is on transportation and land use planning. SANDAG Maps and GIS (San Diego Association of Governments) Includes several interactive mappers and downloadable geospatial data. San Diego Geographic Information Source (SanGIS) (City and County of San Diego) Geographic data warehouse that includes a map gallery,an interactive mapper and downloadable geospatial data. San Francisco Bay Area EcoAtlas (San Francisco Estuary Institute) Environmental data and information about the San Francisco Estuary and its watersheds. Southern California Association of Governments (SCAG) Interactive Atlas - Interactive atlas allows one to create, view, and print maps using demographic and economic data layers; and city, county, and zip code boundary files. Also includes an associated Electronic Map Gallery.